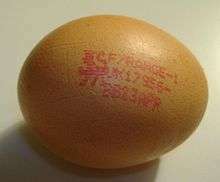 A free-range egg purchased in the UK. Free-range eggs are eggs produced from birds that may or may not be permitted outdoors. 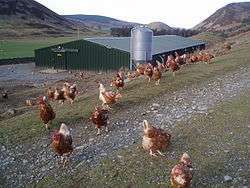 The term "free-range" may be used differently depending on the country and the relevant laws, and is not regulated in many areas. Legal standards defining "free-range" can be different or even non-existent depending on the country. Various watchdog organizations, governmental agencies and industry groups adhere to differing criteria of what constitutes "free-range" and "cage-free" status. The U.S. Department of Agriculture (USDA) requires that egg producers be able to demonstrate that "free range" egg layers have access to the outdoors, though there is no government oversight as to the quality of the external environment, or the amount of time the hen has access to it. Many producers label their eggs as cage-free in addition to, or instead of, free-range. Recently, US egg labels have expanded to include the term "barn-roaming," to more accurately describe the source of those eggs that are laid by hens which can not range freely, but are confined to a barn instead of a more restrictive cage. Cage-free eggs have been a major cause of debate in the United States especially in more recent years, especially being that it is the 4th largest protein commodity. In 2015 there was a proposed initiative that would ban the sale of in-state meat or eggs "from caged animals raised anywhere in the nation".This shift from caged to cage-free is concerning for egg industry groups because they believe that this will cause the price of eggs to skyrocket to the point that consumers can not afford to buy them, which will cause a decline in the egg industry all together. Humane society advocates are arguing on the other hand that costs will really not change as drastically as industry groups are expecting and that the price of eggs will remain almost the same because the housing of the birds does not make a huge difference to cost. Egg industry groups are making an effort to show or "educate lawmakers, voters and consumers about the merits and cost-effectiveness of cage use". Some are saying that we must look at the facts and not rely on the "emotional response from consumers". Local farmers and producers say that the shift will occur if that is what consumers want, they will adapt to having birds in cages or out of the cage. Not only are there debates between the egg industry and the animal rights advocates but people are also debating whether or not this issue is one that has to be handled by the federal government or left for the people in the industry to figure out. In the EU, cage-free egg production includes barns, free-range, organic (in the UK, systems must be free-range if they are to be labelled as organic) and aviary systems. Non-cage systems may be single or multi-tier (up to four levels), with or without outdoor access. In the UK, free-range systems are the most popular of the non-cage alternatives, accounting for around 44% of all eggs in 2013, whereas barns and organic eggs together accounted for 5%. In free-range systems, hens are housed to a similar standard as the barn or aviary. In addition, they have constant daytime access to an outside range with vegetation. Each hen must have at least 4 m2 of space. 15 cm of perching space per hen. Case studies of free-range systems for laying hens across the EU, carried out by Compassion in World Farming, demonstrate how breed choice and preventive management practices can enable farmers to successfully use non beak-trimmed birds. In 2012, the Australian Egg Corporation Limited, the body for the industry, tried to register a free-range trademark allowing 20,000 hens per hectare on the range. This sparked a major discussion between large producers, small producers, animal welfare groups, and consumer rights groups. The trade mark was rejected by the governing body of the ACCC on the grounds of deceptive conduct and the industry is set to be strictly regulated to stamp out widespread cheating. 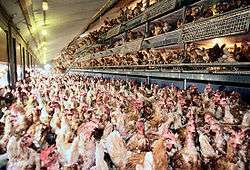 There is a voluntary code allowing for 1,500 hens per hectare which is widely ignored by the major egg producers. The Queensland government approved an increase in free-range layer hen stocking densities in July 2013. The maximum number of hens per hectare was increased from 1,500 to 10,000. In March 2016, Australian ministers voted in new national standards for the definition of free-range. The new standards allow for up to 10,000 birds per hectare, with no requirement for the hens to actually go outside. CHOICE, Australia's largest non-profit consumer organisation believes Australia's consumer affairs ministers made the decision to put the interests of large-scale Australian egg producers ahead of the needs of consumers. A group called PROOF (standing for Pasture Raised On Open Fields) is now in the process of developing an accreditation scheme which will see the term "pastured" start appearing on cartons. The guidelines for PROOF's pastured eggs allow for a maximum stocking density of 1500 birds per hectare (in line with the Commonwealth Scientific and Industrial Research Organisation (CSIRO) Model Code) as well as requiring that hens are able to range freely in open fields or paddocks. So far, PROOF has 12 licensed egg farms in Australia, with another eight in the pipeline. Based on data in the European Commission's socio-economic report published in 2004, (prior to battery cages being banned in the EU) it cost €0.66 to produce 12 battery eggs, €0.82 to produce 12 barn eggs and €0.98 to produce 12 free-range eggs. This means that in 2004, one free-range egg cost 2.6 cents more to produce than a battery egg, and a barn egg cost 1.3 cents more to produce than a battery egg. The Commission’s report concludes that, if costs were to increase by 20%, which it says is the type of percentage increase in terms of variable costs that producers are likely to face as a result of switching to free-range, the industry will potentially suffer a loss of producer surplus of €354 million (EU-25). The margins achieved by producers for barn and free-range eggs are appreciably higher than those that were available for battery eggs. The Commission’s socio-economic report shows that margins for free-range eggs were around twice as high as those for battery eggs. 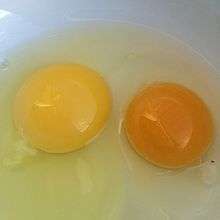 Photograph of two hen egg yolks, one from a commercial egg operation and one from a free-range backyard hen. The yolk of the backyard egg is bright orange. Free-range eggs may be broader and have more of an orange colour to their yolks owing to the abundance of greens and insects in the birds' diet. However an orange yolk is no guarantee that an egg was produced by a free-range hen. Feed additives such as marigold petal meal, dried algae and alfalfa meal can be used to colour the yolks. 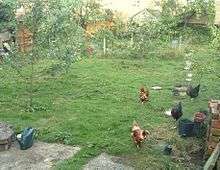 Contrary to popular belief, free-range regulations do not necessarily require that hens spend substantial time outdoors, only that the hens "have access to the outdoors". This access may be for very brief periods and the outside area may be small and sparse. Stocking densities indoors are often high, and many hens may stay inside as dominant hens often prevent the others from having access to the outside yard..
A 2010 Department of Poultry Science, North Carolina State University, Raleigh, scientific study found no significant nutritional advantage to free range eggs. However, other studies have found evidence to the contrary. Several major retailers have a policy of selling only free-range eggs, or, not selling battery-cage eggs. Some retailers apply this policy not just to eggs in their shells, but also to eggs used in baked goods and processed products such as ready-made meals, quiches and ice cream. In the UK, The Co-Operative and Marks & Spencer sell only free-range shell eggs and use only free-range eggs in their entire range of baked goods, processed products, and ready-made meals. Waitrose sells only non-cage shell eggs, and uses only free-range eggs in their processed products and ready-made meals. As of 1 January 2007 (with one minor exception), all Austrian supermarkets no longer sell battery eggs. Many retailers in the Netherlands, including Albert Heijn and Schuitema (subsidiaries of Ahold), Laurus (including Edah, Konmar and Super de Boer), Dirk van den Broek (including Bas van der Heijden and Digros), Aldi and Lidl sell only free-range shell eggs; however the free-range eggs that are sold in Aldi and Lidl do not meet some country's recommendations for the production of free-range eggs. Three Belgian supermarkets: Makro, Colruyt and Lidl, no longer sell battery eggs. The Commission’s report states that Sweden's move away from conventional battery cages has been aided by the decision by the four largest retailers (who between them account for 98-99% of the Swedish retail market) to stop stocking conventional battery eggs. U.S. food suppliers Aramark and Unilever have announced they intend to buy only cage-free eggs, but as of 2013 there are not enough available to supply them.Thus, the label on Hellman's Mayonnaise proclaiming the product is made with free-range eggs is misleading and untrue. Rescue hens (red) and point-of-lay hens (dark) co-exist in a private orchard. In the UK, charities such as Fresh Start for Hens and British Hen Welfare Trust organise rehoming for ex-factory hens that would otherwise be slaughtered. Private smallholders pay around £4-5 per "rescue hen", and these birds (which may still be laying daily) then spend a "retirement" in a true free-range environment. The BHW Trust says that there is no better education than watching an ex-battery hen's confusion and bewilderment turn into wonderment at her new environment. ↑ "Meat and Poultry Labeling Terms". fsis.usda.gov. United States Department of Agriculture: Food Safety and Inspection Service. Retrieved 12 October 2015. ↑ Kelso, Anders (23 December 2013). "Farm Fresh? Natural? Eggs Not Always What They're Cracked Up To Be". npr.org. National Public Radio. Retrieved 12 October 2015. ↑ "Egg industry yielding in cage-free fight". POLITICO. Retrieved 2015-10-15. ↑ Van Den Brand H, Parmentier HK, Kemp B (2004). "Effects of housing system (outdoor v. cages) and age of laying hens on egg characteristics". Br. Poult. Sci. 45 (6): 745–52. doi:10.1080/00071660400014283. PMID 15697013. ↑ "Turkey raised by the rules". USDA. Retrieved September 24, 2015. ↑ Dan Charles (2013-06-27). "What The Rise of Cage-Free Means For Chickens". NPR.